Collectively, individual actions create global change. Your actions, your voice, and your choices, all have a huge impact. Below are just a couple of our annual goals. Your help is so appreciated! Citizen Science Skills. Our educational programs help to to improve watershed health, create jobs, and make education real. And we have much more demand from teachers, citizen scientists and NGOs than we have available funding. Your support helps get us on the ground, collecting ecological data, developing erosion control and restoration strategies and empowering people to do stewardship work that creates clean water, resilient wildlife habitat, and communities connect to the earth. Transportation. Teachers are not be able to get kids outdoors unless we get transportation money. At the recent training, several teachers told us that getting funding for transportation to and from the rivers is keeping kids from participating. After hearing this, we knew we had to do something. Your support will get kids outdoors, connecting to their local rivers, and learning important skills for caring for their watersheds. 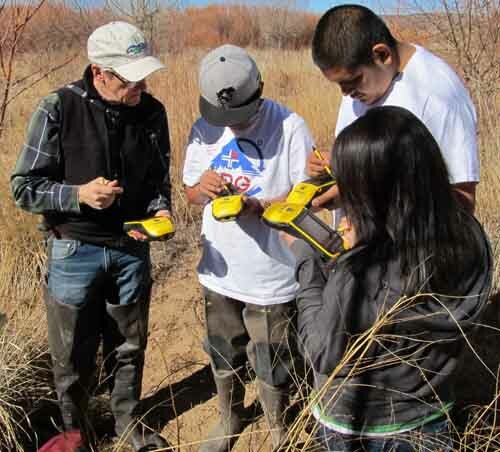 River Source is grateful to the Bosque School of Albuquerque, New Mexico, for sponsoring River Source as our fiscal agent. All donations are tax-deductible through the Bosque School, a 501c3 non-profit organization. Click here to go to DONATE NOW!